There was once an old woman who hated housework. One day she began to grumble. "HATE IT! HATE IT! HATE! But it seems that this is her lucky day. Her complaints call in a troupe of fairies. "Your luck has come! Open the door. Let me in and you'll work no more." One by one the fairies enter and take up her hated chores. "Clankety clankety!" One does the dishes. "Swishety swishety!" Another sweeps the floors. "Flumpety Flumpety!" A third straightens the bedclothes. "Clickety clickety!" The final fairy makes the knitting needles fly. But instead of dropping the work and leaving, the fairies begin to undo all their work. Dishes and floor are re-dirtied; the bedclothes and knitting are all undone and tangled on the floor!What to do? The old woman locks her messy cottage up behind her and goes to see the wise woman of the village for advice. The wise woman tells her to turn everything in her cottage upside down, lock the door against the fairies no matter what they do, and then gives the old woman some special advice. The angry fairies try all their tricks to get inside and do all the work all over again, even calling upon the broom to open the door, but the head-downward broom cannot obey. Then, with the fairies at last vanquished, the old woman sets out to put everything to rights. It's more work than ever, and the old woman still doesn't like doing it. She stopped just in time. ...love it! Love it! LOVE IT! 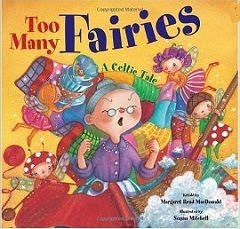 Margaret McDonald's Too Many Fairies: A Celtic Tale (Marshall Cavendish, 2010), cheerily illustrated by Susan Mitchell, is a jolly Celtic version of the old folktale best told by Margot and Harve Zemach, It Could Always Be Worse: A Yiddish Folk Tale (Michael Di Capua books) in which a grumpy head of household learns an equally pointed lesson about constant complaints.